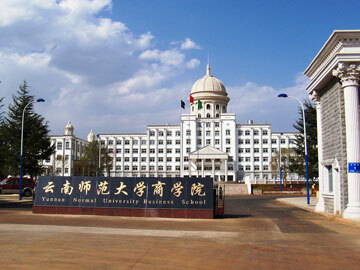 Click here for some photos of Kunming Medical University. 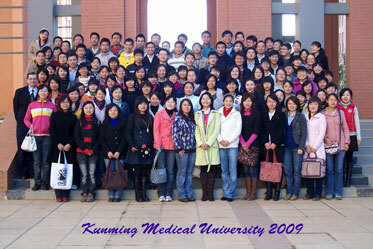 This is my last big class of post-grad medical students at KMU (fall 2009). 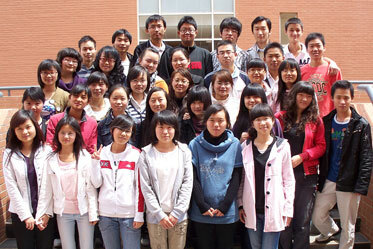 About half of them have continued to be my students in the spring, along with about 80 sophomores (see below). On the left you can see my (Michael's) fall 2008 and 2009 post-graduate students. 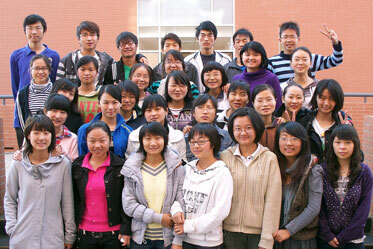 They have the chance to take an English class in the first year of their three-year medical school program. 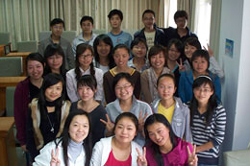 Actually, they are so busy in the spring that their English course is only one semester, but about half of them voluntarily continued studying as my students in the spring. I felt honored that they love English (and appreciate my efforts) so much that they would add this to their schedule. 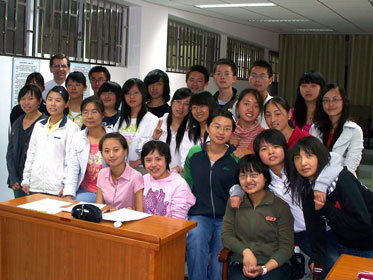 In the spring of 2009, I also got to teach three classes of sophomores on the old campus. 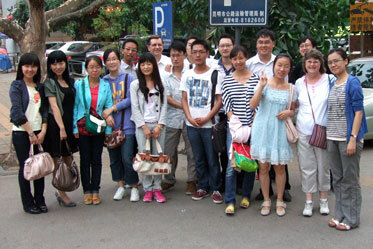 In the fall of 2009 they moved to the new campus in Cheng Gong, where I continued to meet a few of them. Left to right: Thursday 10:30 a.m., Thursday 8 a.m., Thursday 2:30 p.m. 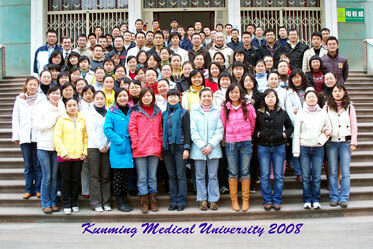 This photo shows Michael's fall 2007 graduate students--the first class he taught at KMU. On the right, Michael poses with his five class monitors, on the way to dinner together. 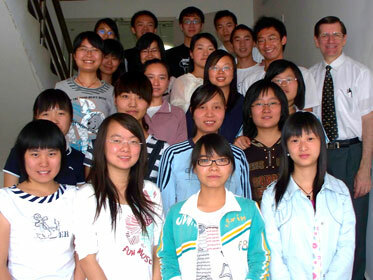 These photos show Michael's first Kunming students (2005-2006) at Yunnan Normal University Business School (YNUBS). 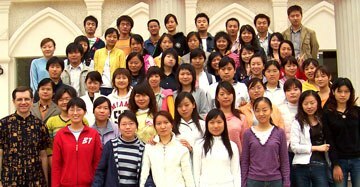 Above, you see many of the young English teachers at YNUBS. I taught this group Advanced Writing once a week. They said I gave them too much homework, but it's impossible to learn to write if you don't WRITE! Unfortunately, writing does take a lot of time, and these teachers are under a lot of pressure to perform teaching duties, continue professional development, and care for the students in a variety of ways. I enjoyed teaching them, and have stayed in touch with several for many years. It's too bad that we all didn't have more time to learn from each other. Michael also taught three freshmen classes of about 40 students each. This is class 1, with class 2 below. 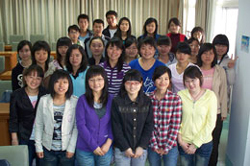 (above) Freshmen Listening/Speaking Class 3 (2005-2006). 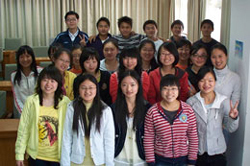 These freshmen classes met with their foreign teacher for 90 minutes per week.  They say that all of their other classes are taught in Chinese (even English classes), so many students have great difficulty understanding the words coming out of a foreign mouth. If you divide 90 minutes between over 40 students you only get about two minutes per person, and that assumes that the teacher never talks (which is a poor assumption in a listening class!). Still, students who worked hard made progress as they built vocabulary and strained to understand spoken English that they can't read at the same time. The big group above was Michael's junior class (which actually met in two sections).